Winter skincare is essential and it’s usually the time people start to notice a difference in your appearance if you don’t look after yourself, so keep reading and find out how to stay bold in the cold. Hydraluron Moisture Boosting Facial Serum: £16.66 – This has to be the mother of hydration. Nothing can compare to this little beauty that packs your skin with long lasting moisture. You apply this before your moisturiser after you’ve cleansed and toned your face. Hydraluron uses hyaluronic acid to hold up to 1000x its weight in moisture. The best part is when you apply your moisturiser, it feels like a completely different product all together. You can instantly feel the hydration and your skin feels plump and radiant. 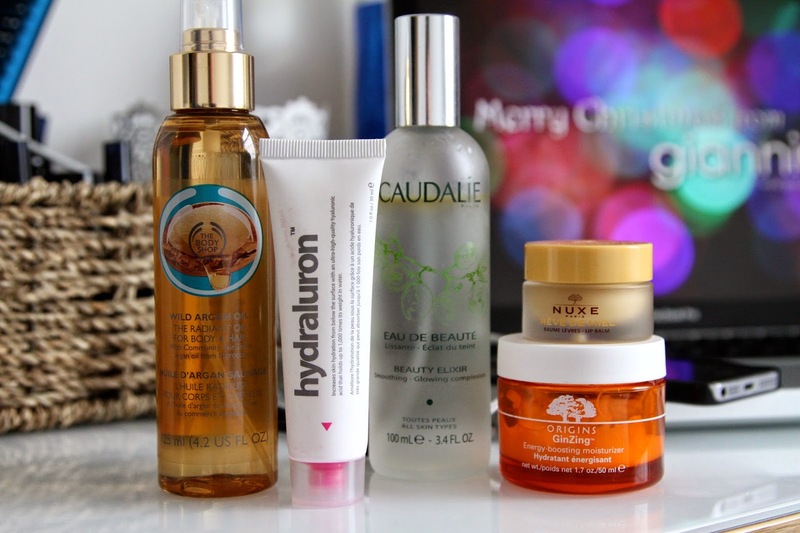 A must have skincare saviour! Origins GinZing Energy Boosting Moisturiser: £20.70 – Pairing this with the Hydraluron is a match made in heaven. I absolutely love this moisturiser and I’m currently onto my second tub. As you can see in the picture, I will soon be on my third. As well as having a deliciously, mouth watering orangey scent to it, it’s packed with intensive hydration and since it’s in the form of a gel rather than a cream, it blends right into the skin with no creamy streaks or excess. I think two and onto three tubs later, I can’t fault this great product. NUXE Reve de Miel Ultra-Nourishing Lip Balm: £8.07 – This was one of the products I first tried in Paris. And I kid you not, this is by far, and I mean BY FAR the best lip balm I have ever used. I hate the glossy, greasy look 9/10 lip balms give you, however this gives you perfectly moisturised and matt! I love the matt finish as your lips look naturally hydrated and healthy. They also have their 20 year special edition balm out at the moment too, which can be found in selected Marks and Spencer’s. The Body Shop Wild Argan Radiant Oil: £14.00 – When your skin is feeling a little dry especially on your arms, this is the perfect little spritz to take away any of the dryness and leaves your body glowing. It also makes you look a lot more tanned and all round healthier. This would be a great little stocking filler for anyone who likes to take care of their body. Just as a little foot note, check out last weeks post for the new Christmas Body Shop range review here. Caudalie Beauty Elixir: £31.00 – Last but not least, when your feeling a little dehydrated and dull throughout the day, theres nothing better than this quick fix. The Caudalie Beauty Elixir gives you a burst of fresh hydration to your face, refreshing and nourishing your skin in the process. It comes in a gorgeous glass bottle with a soft spray pump, a complete statement piece to your beauty shelf. Some people may say, £31.00 for a bottle of grape water, but it’s a complete experience in its self and all I can say is you must try it to believe it. If you don’t want to fork out £31.00, you can buy a 30ml bottle for £13.00.